Jeremy Antley holds a PhD in Russian History from the University of Kansas and resides in Portland, OR. Beyond his interest in Russian Old Believers in Oregon, Jeremy also writes about wargames. His latest essay on Twilight Struggle can be found in Zones of Control: Perspectives on Wargaming (MIT Press, 2016). 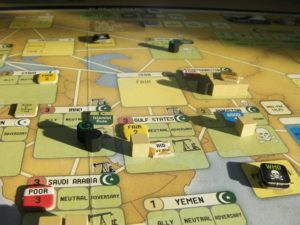 As so often is the case with contemporary wargames, however, current events began to age Labyrinth’s model. Mohammed Bouazizi’s act of self-immolation in Tunisia on 17 December 2010 occurred some six weeks after Labyrinth’s release. By the end of 2011, Mubarak was no longer President of Egypt, Gaddafi was captured and killed in Libya, and Assad began civil war in Syria. Labyrinth players took notice and posted their desires on Boardgamegeek (BGG) and Consimworld (CSW) forums to update the game’s model. “At the risk of trivializing the profound, I think we’re going to need some new cards,” wrote one player on 28 January 2011 in the Labyrinth forum at CSW. Over at BGG, on 5 February 2011 in the ‘Mideast Protests and Expansion Cards’ thread, another player asked: “what are the odds of an expansion pack,” and observed, “it’s hard to ignore the protests in the Middle East as having an impact on the game.” Calling for additional event cards became a means by which players sought to update Labyrinth. Understanding why reveals how wargames claim the attribute of producing knowledge through play. At its core, Labyrinth is a two-player wargame depicting ideological and physical conflict between the United States and Islamic Extremists. The US player seeks one of two outcomes for victory: raise collective governance levels of the Muslim world or eliminate all Jihadist cells. The Islamic Extremist player seeks different objectives: find a way to resolve a weapons of mass destruction plot in the US, bring Islamic theocratic rule to multiple nation-states, or decimate both US prestige and collective governance levels of the Muslim world. Event cards enable players to place and move forces, carry out operations, and recreate historic events. The card-based system is the engine which powers Labyrinth’s model; the cards are thus perfect for exploring linkages between wargames, play, and knowledge. “The Sun Rises on the Middle East,” accessed at BoardGameGeek. Labyrinth’s gameplay models real-world current events. At their core, wargames seek to fuse two essential elements: simulative fealty to reality and the abstraction required to make them playable. Early games with a combat theme, such as Chess or even Go, certainly proved abstract enough to be playable but their models reflected few, if any, aspects of warfare as it actually occurred. Over the centuries several designers introduced incremental improvements, such as use of tiles to represent terrain and charts and tables to model wind effects or firepower, but it was the breakthrough design known as Kriegsspiel that bridged the gap between abstraction and simulation and ushered in the modern era of wargaming. Introduced in 1811 by Baron von Reisswitz, and later refined by his son, Johann von Reisswitz in 1824, Kriegsspiel combined modular topographical maps depicting actual terrain, small wooden blocks to represent various sizes and types of troop formations, as well as quantified combat results tables to resolve conflict between opposing forces. Endless scenarios, both historical and plausible, could be recreated playing Kriegsspiel: its modularity allowed it to tackle subjects limited only by imagination or inclination. It became possible to compress the actual, gritty nature of warfare into a much smaller temporal and spatial footprint. A junior officer no longer needed to experience combat to exercise skills required of their trade. They could, instead, practice maneuvers and tactics within the safe confines of peacetime in a matter of hours instead of days or weeks. When the Chief of the Prussian General Staff, von Muffling, declared upon participating in a 1824 demonstration of Kriegsspiel, “This is not a game! This is training for war!”, the process of solidifying linkages between play and production of knowledge in modern wargames became affirmed. Commercial wargames follow in this tradition established by Kriegsspiel, even though their level of abstraction is often several times greater than modern military counterparts. Focusing on the modular nature of event cards in Labyrinth allows one to understand how these linkages function. Why do Players Turn to Event Cards? What qualities do event cards possess that make them desirable for modifying wargames? To begin, event cards possess extra-legal properties. Materials found in wargames are often governed by terms set forth in the rulebook. Not so with Card Driven Games (CDGs) like Labyrinth. Most CDG rulebooks contain clauses attesting to card superiority in deciding the rules-state. For Labyrinth, this occurs in section 6.2.2: “whenever event text conflicts with game rules, the event governs” (7). Extra-legality allows designers to utilize cards for scripting purposes without resorting to conditional parameters within the base ruleset. For players seeking to inject corrective or argumentative scripting, extra-legality allows maximum editorial content at a minimum of rules interference. When a player posted in the CSW forum on the adaptability of the Financial Crisis to the game’s model on 3 February 2011, they did not need to present ruleset changes because interpretation of a Financial Crisis card proved sufficient. Event text found on a Labyrinth card also claims direct connection to extra-legality. This is because event text anchors otherwise extra-legal cards to the game’s model through translation and abstraction of scripted intent into ludically meaningful terms. 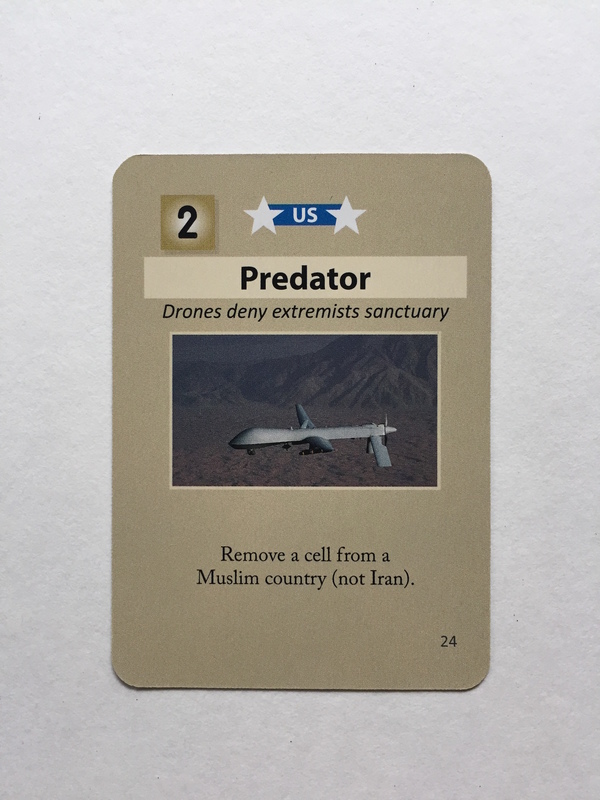 Play of ‘Predators’ (in reference to the titular military drones) causes the event text, “Remove a cell from a Muslim country (not Iran),” to create both game effect and argumentative affect precisely because extra-legality enables such text to carry ludic weight. Remaining elements – photograph/illustration of the card’s subject, flavor text, and iconography – do not depend on extra-legality but rather enhance the card’s connection to event text through use of aesthetics. This too is appealing to players seeking wargame modification because aesthetics play an important role in event card creation. Since composition of an event card involves combining ludic and aesthetic elements, it is more accurate to label designer and player efforts alike as montage. Take, for example, submission on BGG forums of ‘Curveball’ on 10 December 2010, just weeks after Labyrinth’s release. The suggested card focused on intrigue surrounding Rafid Ahmed Alwan al-Janabi, an Iraqi citizen who sought asylum in Germany in 1999 and claimed knowledge of mobile biological weapons laboratories in Iraq. Despite noted misgivings, US authorities nonetheless utilized testimony of ‘Curveball’, al-Janabi’s assigned codename, as part of their justification for invasion of Iraq in 2003. Closer examination of ‘Curveball’ reveals the contributor’s careful use of montage to translate repercussions surrounding al-Janabi’s claims into a Labyrinth event. Use of montage in film, in which a sequence of cutscenes set to music help viewers comprehend larger narrative development in a shortened time frame (think training for a fight, a la Rocky III, or advancing through a tournament, like the Karate Kid) is, perhaps, the most widely understood application of the technique. Yet montage can and does exist in other media. Marcus Boon outlined several qualities of montage in his book, In Praise of Copying. Montage involves fragmentation of an original object and tactile exploration of material used–in this case using argumentative rhetoric. Juxtaposition and selection of particular elements or fragments in montage are equally important. Finally, naming and framing the new object completes the montage act (Boon 144-145). ‘Curveball’ contains all of these qualities. The larger story behind al-Janabi’s experience is fragmented into various useable pieces. His background and connection to Labyrinth’s subject matter find pithy expression in the flavor text: “shadowy informant claims Iraq has a WMD program.” Most important is the fragmentation, juxtaposition, and arrangement of ‘Curveball’s’ historic influence into event text that possesses ludic meaning. ‘Curveball’ not only has preconditions for being played, such as Iraq being considered an adversary to the US, but also allows the US player to search the discard pile for the ‘Iraqi WMD’ event card that allows regime-change invasion. Cementing the montage act is selection of the image used for the event card. A black and white depiction of a man’s face, eyes and neck obscured by darkness, became the image favored by the creator. This appears at first to be a curious choice given that Curveball’s identity was revealed to be al-Janabi in late 2007. While the creator could have chosen to utilize al-Janabi’s actual image and name for their 2010 creation, they selected to instead go for a completely anonymous depiction. Why? 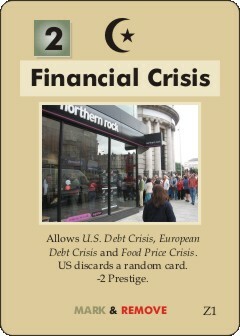 The answer lies in the need to ensure aesthetic unity of the Curveball card itself. The visual effect of the shadowed face dovetails with the card’s flavor text, just as the historic effect of Curveball’s claims dovetails with the event text whereby the player can search for and play the casus belli event allowing invasion of Iraq. All elements of the card as a whole combine to create both ludic effect for the game and associative affect in the mind of the player. Using montage, the creator of ‘Curveball’ deftly took an original subject and combined fragmentation, juxtaposition, and framing to create a facsimile in the form of a Labyrinth event card. Yet while montage helps decipher creation of event cards, it does little to explain why players feel driven to create cards in the first place. For that, a look at the July 2013 suggestion for a ‘Snowden’ event will prove illustrative. “I would like to ask for some opinions about what a Snowden event card should do for/against the US,” read a BGG forum post dated 6 July 2013, almost four weeks after Edward Snowden revealed himself as the source of leaked classified documents detailing NSA surveillance programs. The post went on to elaborate what the card would look like. 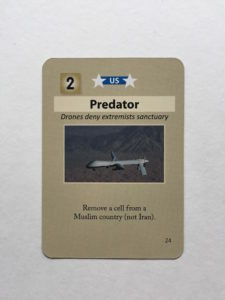 Titled ‘Snowden’, with the flavor text “whistle-blower reveals US eavesdropping abilities,” the event lowered US prestige, flipped three European nations to a posture opposite of the US, and prohibited “War of Ideas” rolls (the primary means by which the US player improves governance levels of Muslim nations) if US prestige is too low. Other players responded. “It is too early to tell,” wrote one player, while another took issue with the flavor text proposed, stating: “because I think it is important to be clear, Snowden does not fit the [out of game] legal criteria and definition of ‘Whistle-Blower’, so I would begin by changing that.” This last comment sparked debate as to Edward Snowden’s appropriate label and revealed the seriousness behind aligning perceived nature of the event to its ludic facsimile. Inaccurate characterization of Edward Snowden in the “Snowden” event card compromised its epistemic reservoir and, subsequently, its capacity to act as an arbiter of knowledge between ludic depiction and reality in Labyrinth’s model. Philipp von Hilgers noted in War Games: A History of War on Paper that “of all centuries, it was the seventeenth…that found in games an epistemic reservoir” (11). During the age of reason, Western intellectuals began to uncover the deeper role played by mathematical systems in art, architecture, engineering, and warfare. The once esoteric nature of complex equations and proofs took on tangible meaning in the lives of seventeenth century artists, architects, engineers, and generals alike as they utilized this newfound understanding to push the boundaries of their respective occupations to new heights. Games, too, became imbued with greater potential as the mathematical models at the heart of their designs became elevated to the “prosperous switch point of knowledge” (11). on Hilgers claimed this freed games “from purposelessness” (11) and allowed their models to comprehend complex subjects that became the concern of increasingly centralized Western bureaucracies emerging during the seventeenth century. Designers could hold up their creations and genuinely claim more than diversion and amusement to be the product of their labors. They could claim that play produced useable knowledge because all elements of game design came together to form an epistemic reservoir of truth that could be plumbed for insight into the myriad concerns underpinning Western society. That wargames can celebrate and emphasize linkages between play and knowledge is due primarily to this seventeenth-century revelation on the potentiality of games to model and explore deeper facets of Western modernity through design and mathematical abstraction. Yet this newfound perception introduced newfound anxiety for designer and player alike over proper abstraction and alignment of a game’s constituent parts. Evaluation and maintenance of these parts, collectively acting as an epistemic reservoir, became paramount if games–and wargames especially–wanted to maintain their elevated, knowledge-producing status. In debates surrounding event and flavor text of “Snowden,” interplay between the event card’s montage and perceived discrepancies revolved around questions about its capacity to serve as an epistemic reservoir. Three arguments wind through the “Snowden” thread, the first dealing with unnecessary duplication. “I know the ‘Leak’ card is similar to this real life event,” wrote the creator of the ‘Snowden’ card in the thread’s opening post, “but I feel that this is a more broad and globally spanning event.” Another player disagreed, but suggested a possible fix stating, “one of the Leak cards could be renamed ‘Snowden’ in your game…IMHO, it is exactly what he Leak card is for.” While the creator felt inclusion of ‘Snowden’ improved Labyrinth’s model, the respondent felt inclusion of ‘Snowden’ diluted Labyrinth’s model and sapped the epistemic reservoir powering all event cards as a result. The second argument focused on proposed flavor text of ‘Snowden.’ After one player suggested that Edward Snowden was not a whistle-blower, mentioned above, the creator responded: “seems to fit the osc.gov definition….” Comparisons to the fictional Soviet Submarine Captain Marko Ramius, from Tom Clancy’s Hunt for Red October, and the actual Chelsea Manning also appeared in back-and-forth responses. Players turned to external references in an attempt to demonstrate that reasoning for flavor text alteration possessed some claim to truth. In doing so they hoped to ensure integrity of the event card’s epistemic reservoir because failure to properly align flavor text with reality diminished the card’s simulative value. Players also commented on the event text of ‘Snowden’ and this formed the third argument. Though their concerns produced fewer posts, their arguments mirrored those discussed above. External references became a measuring stick by which event text could be validated as accurate and properly abstracted. Labyrinth players poured over various montage fragments constituting event cards and judged such fragments depending on perceived service to the epistemic reservoir found within. Both montage and epistemic reservoir worked together in a circular relationship for players seeking to modify wargames. Montage created conditions whereby the completed act yielded a vessel capable of sustained use as an epistemic reservoir that in turn provided justification for adding and critiquing new event cards using montage. Boon, Marcus. In Praise of Copying. Harvard University Press, 2010.
von Hilgers, Philipp. War Games: A History of War on Paper. MIT Press, 2012. Kirschenbaum, Matthew. “Playing the Present Gaming Egypt with GMTs Labyrinth.” Play the Past, 3 February 2011. Labyrinth The War On Terror, 2001-? Rules of Play. Second Edition, 2011. The Sun rises on the Middle East. Digital image. Board Game Geek. Board Game Geek, 01 Nov. 2011. Web.